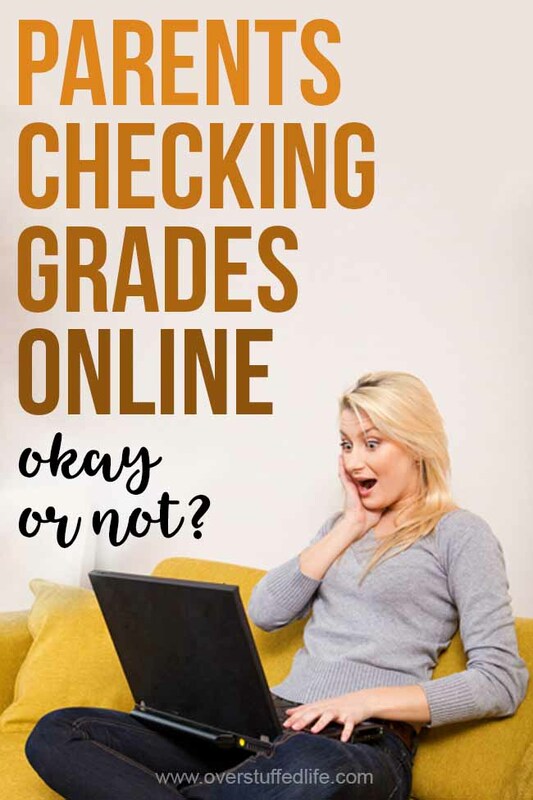 Is it okay for parents to be checking grades online? Find out the pros and cons and make the decision that's best for you and your kids. I get online almost every day and quickly check my girls' grades. In Michigan, we use PowerSchool, and while we are here in Utah on our sabbatical, their grades are on a program called Skyward. I know there are many other similar programs out there, and it is pretty likely that your children's school is using one of them. I didn't realize until recently that the very act of checking your child's grades on one of these programs is quite controversial! As I was reading several different articles detailing why you shouldn't check your child's grades, I was convinced that the reasons they laid out did have some merit—especially in this generation of helicopter parenting. But I also felt that they were missing the good reasons to check grades, so I wanted to make sure I presented both sides. The cons certainly haven't stopped me. Like I said before, I check nearly every day. Still, it's good for me to be aware of the cons because it helps me to stay balanced and not fall into the traps that sometimes happen with checking grades. In this age of helicopter parenting, something as simple as being able to check your child's grades whenever you want can really contribute to the problem. Helicopter parenting is best defined as a parent who discourages a child's independence by hovering and being overly involved in the child's activities. Helicopter parents are famous for swooping in and removing any discomfort, difficult situation, or obstacle to the child's success. Clearly, it can be tempting for parents with helicopter tendencies to want to do something about bad grades in an inappropriate manner. Things like calling the teacher to demand a better grade or doing the child's homework for him would be classified as helicopter parenting. Even if you don't resort to extreme things like doing homework for your child, it can definitely contribute to micromanaging their school work. In order to raise children who are successful in life, we must also raise them to be independent and responsible for their own work. 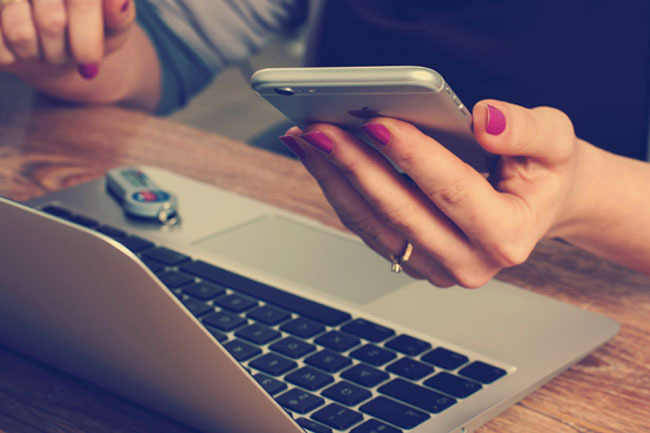 A parent who goes online to check grades and assignments too often might unwittingly teach their child that they will always do it for them. The child then does not pay attention to what homework is due unless mom or dad tells them to. The biggest complaint I read from students with parents who checked grades often was that the parent was more concerned with the actual grade than they were with what the child was learning and understanding. Grades should only be a way to gauge learning, and we should not over-emphasize getting straight As to our children. One of the main reasons I check my girls' grades often is so I can see whether or not they have missing assignments. Sometimes they forget to pick up an assignment when they were out sick and it helps me to remind them to grab it so they can get it in. I have one child who simply forgets to turn in her work on a regular basis. Seeing what is missing helps me to help her stay on track. It is always the responsibility of my children to turn in their missing work, and if they still don't do it, they have the consequence of a lowered grade. My role is simply to tell them that I noticed they are missing the assignment. I think it is interesting that all three of my children are very different in regards to the way they approach their school work. I have one who always has her work done and needs very few reminders to do her homework. I have another one who mostly gets it done herself but is easily distracted and needs reminders to stay on track for long-term assignments or studying for upcoming tests. I have another who forgets to turn things in, dislikes school work, and puts up a pretty big fight when asked to do her homework. Obviously, I need to approach each child differently, and the information I have from PowerSchool helps me to do that more effectively. If I see a missing assignment from the child who is usually on top of everything, I only have to ask her if she realizes the assignment is missing. She generally already knows and has a plan for fixing it, but every once in a while she honestly forgot and my reminder helps her to get it done quickly. If I see a missing assignment from the one who has all the missing assignments, I have to approach her differently. We need to really hold her hand sometimes to get her to stay on track in school, and while some would say that's over-parenting, to me it is just parenting. I do not do the work for her, I only give her multiple reminders. She is ultimately responsible for her work and sometimes the consequence for refusing to do it is a grade she is not happy about. Last year Bria was cruising along in geometry and doing really well. Then, all of a sudden, her high quiz and homework grades dropped quite low. After talking to her about it, I learned that she simply did not understand the latest unit. To make things worse, her regular teacher was out on maternity leave and the substitute did not have the skills to help her understand the material. That may be a more drastic example, but being able to see grades in real time has helped me as a parent to know when I need to help my kids more. Sometimes this has meant hiring a tutor, sometimes it has meant contacting the teacher, sometimes this has meant my child talking to the teacher and asking for extra help, sometimes it has simply meant that I sit with them while doing homework and help them to understand. 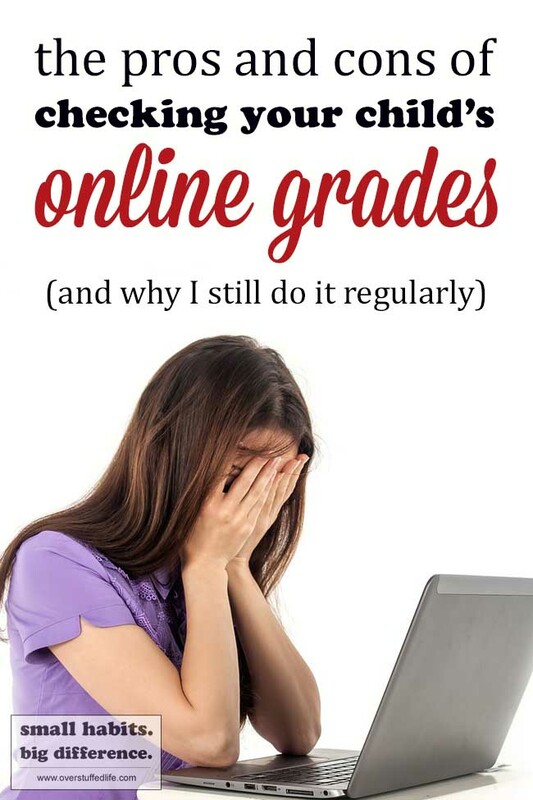 My friend says that she appreciates being able to see her kids' grades online because she catches those problems in understanding before her kids are ready to admit they are struggling. She uses it as an opportunity to sit with them during homework time as moral support and to be there for them to ask questions—and sometimes that's really all they need. I would rather go into a parent-teacher conference knowing exactly how my child is doing and ready to discuss a plan for them to be more successful than going in with no knowledge at all. Because I check grades and communicate with my children often, I can go in and talk to the teacher and give my perspective on how my child is doing in school, and why they may be struggling. A few of my friends who are teachers mentioned that they appreciate when the parent is on top of the grades online for this very reason. One of them also said that the kids who keep track at home tend to perform better in school simply because they are more aware. Remember my child who struggles getting things turned in? Well, that same child is really motivated by praise. I am sure to praise her like crazy when I see she has done well on a test or turned in something that was previously missing. This does wonders for her performance on later tests and assignments. I actually think that praise is a good motivator for all my kids. It makes them feel great to know that you see and appreciate the hard work they are doing. Yes. Even though one of the cons is that it can take away the child's responsibility, it can also do the opposite. I mentioned before that when I see problems arise, my only job is to let my kid know I see them and possibly help them work out a solution. They are 100% in charge of fixing those issues. They are accountable for doing their own work, getting help from their teachers, and turning in their assignments. The older they get, the more personal responsibility I require of them regarding their school work. One friend of mine checks her son's grades every Monday. If he has fallen below the grade benchmark they have set as a family or has any missing assignments, he has until Friday to get those things taken care of however he needs to if he wants certain privileges for the following week. Maybe it's turning something in, retaking a test, or just talking to the teacher. My friend likes that the ball is completely in his court and he has sufficient time to think about whether or not it's worth it to him to earn the privileges by taking personal responsibility. Another friend bases allowance off of grades, so she checks them weekly for that purpose. While I don't like paying for grades, it definitely works for some families and can be a great way to teach responsibility. While I do want my kids to be independent and totally responsible for their own success in school, it is ultimately my job to help them learn to do that. As my kids have gotten older, my stance on this has actually changed quite a bit. 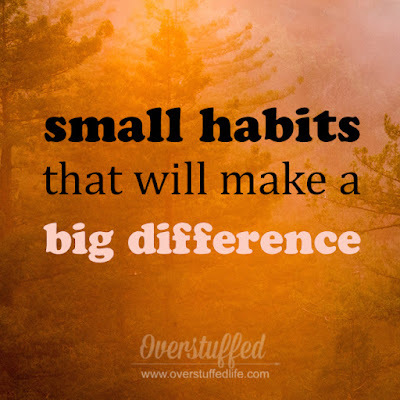 I have learned that teenagers are incredibly stressed and overextended, and I see no problem with helping them to be successful however I can. While that doesn't mean doing their work for them, it does mean helping them to stay on top of their work. Plus, each child is different and will need different things from you as a parent when it comes to their success in school. Ideally, kids should check their grades on their own, see the issues themselves, and come up with a plan. Soon enough, they will be out of your home and off to college where they will have to do it. Part of checking up on your kids' work online is helping them to learn these essential skills and then learn to utilize those skills without your help. My high school and middle school students both have the PowerSchool app on their phones (I haven't figured out Skyward enough to see how to do a phone app, but we're only here for a semester). They have learned to routinely check their grades and we continue to work on how to make plans to remediate things that aren't going so well. This will serve them well when they are in college—as will having practice speaking to their teachers and asking for help. Clearly, for me, the pros far outweigh the cons—I just have to make sure I am not micromanaging them! Small Habit: Check your children's grades online. 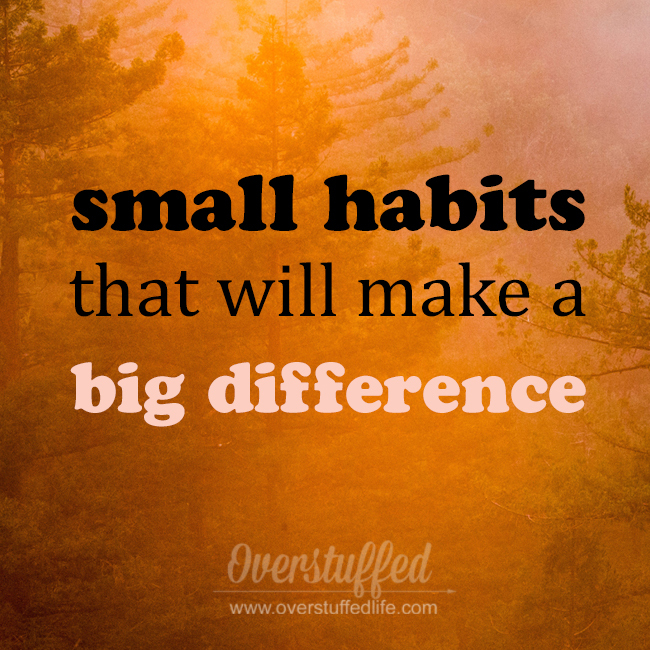 Big Difference: Help them be more successful in school and teach them personal responsibility,. Guess what? This is exactly what big companies are paying me for. They need to know what their customer base needs and wants. So big companies pay millions of dollars per month to the average person. In return, the average person, like me and you, answers some questions and gives them their opinion.